July is the National Ice Cream Month! Just in case you didn’t know that already. You know how much I love my whipped milk ice cream though. I made them countless times. Chocolate was a favorite for a while, but then I went a step further and turned them into my Hubby’s favorite dessert. Cheesecake ice cream… Mmmm…. Cheesecake ice cream…. Aaaaanyways, as I am not done with strawberries this season, I added them to my ice cream and POW! Gorgeous, delicious, soooo creamy and actually good for you. Remember, the whipped milk ice cream has only two ingredients. Evaporated milk and some sugar. No eggs, heavy cream or half and half. Add low-fat cream cheese and fresh juicy strawberries ( so sweet that you can easily decrease the amount of sugar ). Still creamy and doesn’t make you feel like you are settling for less. Because you should never do that. No settling for less when it comes to a dessert. That defeats the purpose. When you want to make it healthy, it still has to taste amazing. And these ice cream do! Add sprinkles just for fun. Sprinkles makes anything look fun and festive. Besides they get cheers in our house. Chill the milk in the fridge overnight. It is crucial for the milk to be thoroughly chilled. Whip until fluffy, about 40 seconds. Add the granulated sugar, slowly pouring into the bowl and whip until combined. Add your vanilla extract and whip until combined. Place the bowl in the freezer for an hour. In the meantime, place the cream cheese in a food processor and mix for 30 seconds, until creamy. Add strawberries and mix until all combined and smooth. Pull out the ice cream from the freezer, whip for 1 minute, add the strawberry mixture and mix until combined. Place the bowl back in the freezer for 1 hour. Whip the ice cream again on medium speed. The water in strawberries will make them freeze faster and they will be harder. You might have to let them sit on the counter for 15 minutes to soften. Store in the freezer in a container with a lid. Note: You can add 2 medium strawberries, chopped, to your ice cream for strawberry bits. They will be frozen solid though, so it’s up to your likings if you like frozen bits of fruit in your ice cream. We tried both and loved it! I made this ice cream today. I also tossed in some chopped graham crackers. I just took a taste…it’s not completely set but tastes amazing! I find the strawberry flavour is getting more intense as it freezes…can’t wait for my boys to try it since they are nuts for strawberries! 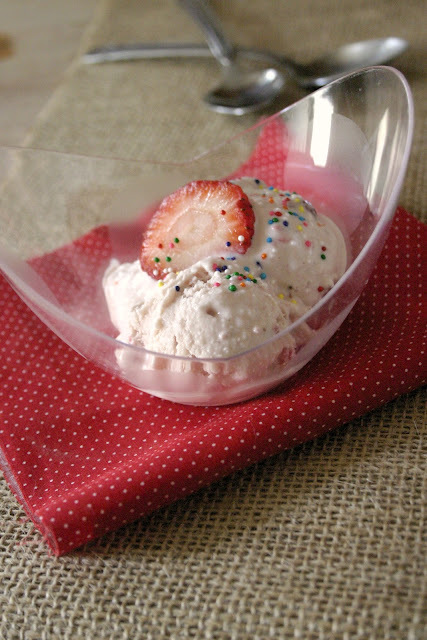 Thank you for the recipe….this whipped milk ice cream is the low fat ice cream I have been searching for! Cheese cake has always been one of my favourites. Wonderful recipe. Awww, thank you, Anne 🙂 I hope you will try them! I would love a 2nd portion, please! You got it, Angie! Thank you! Skinny ice cream….. YES PLEASE!! What a great recipe. Have a wonderful weekend! This looks really good–and guilt-free! Perfect for those (like me) who want a sweet treat AND to fit in their jeans. Thank you and welcome to CCS, Sarika! Skinny ice cream? I am IN! I like the idea of using cream cheese in an ice cream – it sounds wonderful! This looks and sounds fabulous! Love your cutsie bowls too! I like the new look of your blog. I am enjoying ice cream these days but only store bought. 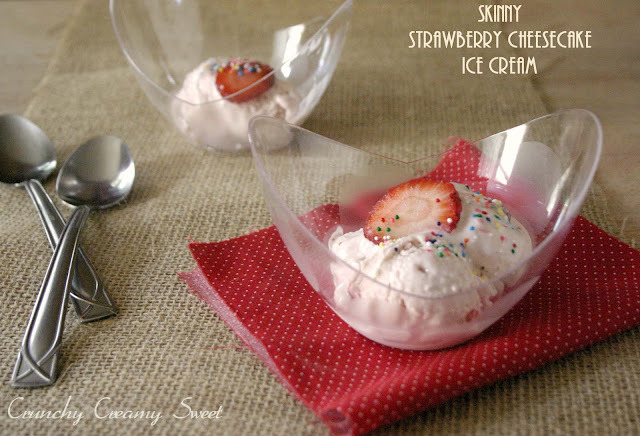 Your skinny cheese cake ice cream is a wonderful recipe to try. Somehow I knew it will lure you in here, Anita 🙂 I am glad you like it! Thank you! This looks delicious! And what a great photo! Yay! I hope you will give these a try! Thank you, Anna! Hi Anna! You and your website inspire me every time I visit. I've nominated you and your wonderful blog for The Addictive Blog Award. You can find more information about the award at http://bit.ly/MDBEIb. Thank you for all your wonderful posts and recipes and also for hosting the Blue Ribbon Challenge! Congratulations!! I love “skinny” part in this recipe. I've been enjoying making ice cream and it's getting a little dangerous from taste testing. 🙂 Love the sprinkle on top of ice cream – so pretty! Hi Nami! I am so glad you like it 🙂 Yes, taste testing can be very dangerous when it comes to delicious ice cream. 🙂 Thanks for stopping by! I've never heard of making ice cream with evaporated milk but I'm definitely intrigued (putting a can in the fridge to chill!). What a great idea, and who doesn't love strawberry cheesecake?! This looks awesome and so easy! Need to try it. Making plain old vanilla as older kid does not like strawberries, but they will make awesome toppings no doubt. Yay! Please, let me know how you like it! Thanks, Minnie! This is a recipe definitely worth saving. YUM! I am so glad you like it, Ellen 🙂 Thank you! This sounds fabulous! Who doesn't love strawberries, cheesecake and ice cream…Simply delicious! Right? 🙂 Thank you, Serena! I hope she will like this version 🙂 Thank you, Ann!